This document provides an overview of how to measure campaigns and traffic sources with the Google Analytics SDK for iOS v3. iOS Install Campaign Measurement - See which campaigns from other apps are referring users to iTunes to download your iOS app. General Campaign & Traffic Source Attribution - See which campaigns or referrers launch your app after it is installed. The following sections will describe when and how to implement each type of campaign measurement in your app. Campaign parameters are used to pass information about the traffic sources and campaigns that are bringing users to your app. gclid Google Ads autotagging parameter; used to measure ads. This value is generated dynamically and should never be modified. After an app has been installed, it may be launched by referrals from ad campaigns, websites, or other apps. In this scenario, referring traffic sources or marketing campaigns can be attributed to user activity in subsequent sessions by setting the campaign fields on a tracker directly. * An example of how to implement campaign and referral attribution. * use the hostname as a referrer instead. id<GAITracker> tracker = [[GAI sharedInstance] trackerWithName:@"tracker"
// parameters from a string url into a Map that can be set on a Tracker. // needs to be sent once. // did not set a campaign source, use the hostname as a referrer instead. // Set campaign data on the map, not the tracker. // A screen name is required for a screen view. // Assumes at least one tracker has already been initialized. // Note that it's not necessary to set kGAICampaignKeyword for this email campaign. // Note that the campaign data is set on the Dictionary, not the tracker. Google Analytics offers out-of-the-box support for iOS Install Campaign Measurement for popular networks and provides the ability to generate your own custom URLs for any additional networks. To enable iOS Install Campaign Measurement, use the iOS Campaign Tracking URL Builder below to generate destination URLs for your ads that send users to the App Store. In order for iOS Campaign Tracking to work, you must have already implemented Google Analytics in your iOS app, enabled IDFA collection, and be tracking one or more screen views or events in your app. You will also need to add an additional framework to your app if you want to use automatic iAd install campaign measurement. Note: iOS Install Tracking only works for ads served through mobile ad networks, such as Google AdMob that serves in-app ads. Select the property and click Property Settings. Make sure iOS Campaign Tracking is ON. Note: If iOS Campaign Tracking is not turned on, Google Analytics will not attribute iOS campaign data to the app data. To correctly attribute a campaign with app data, the iOS campaign tracking URL and your app tracking implementation need to use the same App ID. 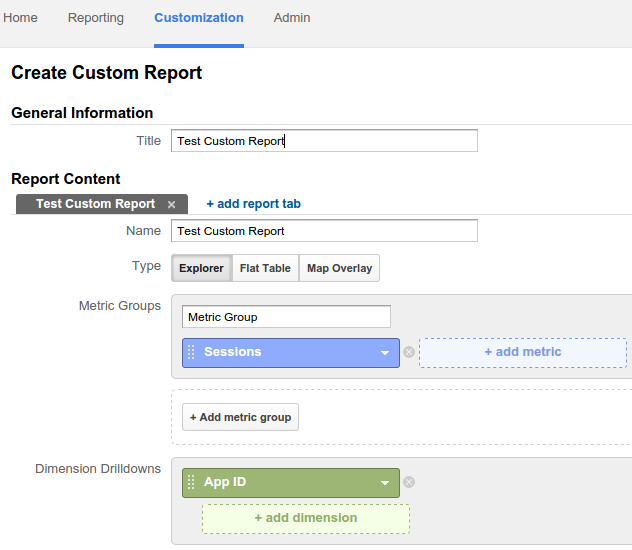 To determine the App ID for an app that you're currently tracking, create a custom report in the Google Analytics web interface with App Id as a dimension and Sessions as a metric. While creating a click iOS campaign tracking URL, use the App ID appearing in the custom report. Your app is using Google Analytics SDK for iOS version 3.10 or higher. Your app is linked with libAdIdAccess.a as part of the Google Analytics iOS release. Your app is linked with AdSupport.framework. If possible use a debugging proxy application to view HTTP requests and confirm IDFA is included. Google Analytics uses IDFA to generate the demographics reports. In Google Analytics, click the Reporting tab and click Audience > Demographics > Overview to check if you see demographic data. If you do, IDFA is being sent correctly. Use the iOS Campaign Tracking URL Builder to verify that the iOS campaign tracking URLs are correct. When selecting the Custom option for Ad Network, make sure to also consult with that network to confirm it supports tracking individual device IDs using redirect URLs. If it doesn't, then you will not see any data in Google Analytics reporting. Use the tool below to generate URLs for measuring the source of iOS application installs. Important: Google AdMob tracking URLs require a &hash=md5 parameter. The iOS URL Builder Tool adds this parameter automatically. If you create your URLs manually, you must add this parameter for iOS AdMob install tracking to work correctly. If you choose ad networks other than AdMob, the &hash=md5 parameter is not required.